On November 20, 2007, H.E. Mme. 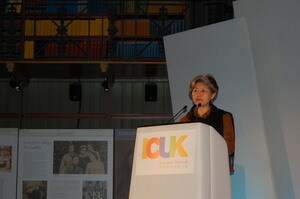 Ambassador Fu Ying attended Launching ceremony of Innovation China UK (ICUK) held in Queen Mary, University of London. Fu Ying highly appraised the contribution of ICUK to Sino-UK technological cooperation. She congratulated on the launch of ICUK, hoping that it could actively support the commercialization of innovation of both countries. Secondly, innovations should be made in development mode. The economic growth should mainly rely on technological advancement, improvement of labourers' quality and innovative management instead of consumption of resources. Thirdly, innovation capabilities should be improved, that is to make breakthroughs in key technologies and support basic research, research in frontier technology and technological research for public welfare and establish a market-oriented system for technological innovation, in which enterprises play the leading role and which combines the efforts of enterprises, universities and research institutes. Fourthly, international cooperation in technology and innovation should be strengthened, that is to make full use of international technological resources, actively carry out governmental and non-governmental cooperation, respect international practices, protect intellectual property right and expand export of hi-tech products and service trade. Fu Ying pointed out that Sino-UK technological cooperation has a solid foundation. UK is the cradle of modern technology and innovation and came forth a lot of great scientists and thinkers, such as Isaac Newton and Charles Darwin. Nowadays, UK is generally regarded as No. 2 scientific research power in the world and has obvious advantage in low-carbon technologies, clean energies, life science, new materials and automatic control. China has huge potentials, pressure and demand for innovations. At present, the contribution of science and technology to China's economic growth is only 39%. China's GDP only account for 5.5% of the world but its energy consumption amounts to 15%. The energy consumption of unit production value of China is 3.5 times of USA and 4.9 times of EU. China must rely on innovation to realize sustainable development and effective solution of resource, energy, food and environment. Fu Ying said, Sino-UK cooperation in technologies and innovation has already built a solid foundation. In recent years, China and UK have set up intergovernmental joint commission on science and technology, mechanism for dialogue on sustainable development, climate changes and have reached cooperation agreements on space technologies, informationization of scientific research, network technologies, research and development of new energies and zero carbon emission. China has established Sino-UK technology parks in Cambridge and Manchester. Both sides are also working for bringing in advanced environment technology from UK to China more conveniently through promoting connections between cities. 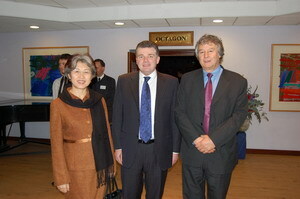 About 150 people attended the ceremony, including Ian Pearson, British Minister of State for Science and Innovation, Adrian Smith, President of Queen Mary, University of London, Jin Xiaoming, Director-General of the Department of International Cooperation, Ministry of Science and Technology, PRC, Wang Baoqing, Minister Counsellor of the Chinese Embassy in UK, David Concar, Science and Technology Counsellor of the UK Embassy in China. ICUK is a two-year-long project aiming at supporting innovation and research with prospect of commercialization. The UK government invests 5 million pounds and the Ministry of Science and Technology, PRC will also provide corresponding financial support. Five UK universities and more than twenty Chinese universities and research institutes participate in the project.